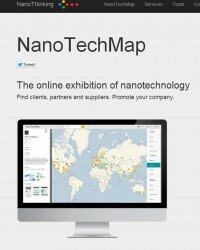 The French consulting company NanoThinking has recently released the NanoTechMap, a worldwide interactive map of nanotech’ companies. The map provides insight into the rapidly growing number of nanotechnology companies aroudn the world. The NanoTechMap provides a comprehensive catalogue of activity and actors in the field. Over 4000 companies are currently registered. The profile of each company gathers up-to-date technical and business information as well as products catalogues, technical datasheets and pictures of products. This interactive tool is primarily aimed at nanotechnology companies but could be interesting for everyone who wants to know more about industrial activity in nanotechnology. The NanoTechMap can be consulted at: www.nanothinking.com (new users will need to sign up to nanothinking.com get access to the interactive map).